Plan Your TripAsk OregonOutdoor AdventureWhere are good places to camp near mountain biking trails? Where are good places to camp near mountain biking trails? Oakridge (50 miles east of I-5 near Eugene) has hundreds of miles of trails. 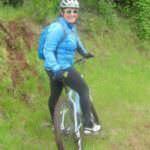 You can camp at Salmon Creek Campground and ride from your campsite about 50 feet onto the Salmon Creek trail. For some of the more challenging and thrilling trails in the area you’ll need a shuttle to various trailheads which are available from Oregon Adventures. Bend/Sisters (Central Oregon, 2 hours from Oakridge) Has fun trails and ample camping. Some popular places to camp are Tumalo State Park and my personal favorite, Smith Rock State Park (both have yurts you can reserve). Your best bet for mountain biking is the Phil’s Trail Network that starts right in Bend. You can also mountain bike at Smith Rock and in Sisters at Peterson Ridge and, farther west, on the McKenzie River Trail. Hood River (Adjacent to the the Washington border, east of Portland) In the last few years Hood River has really emerged as a mountain biking destination, which pairs exceptionally well with this outdoorsy waterfront town. You can camp at Lost Lake Resort and Campground and ride nearby Post Canyon Trail System.